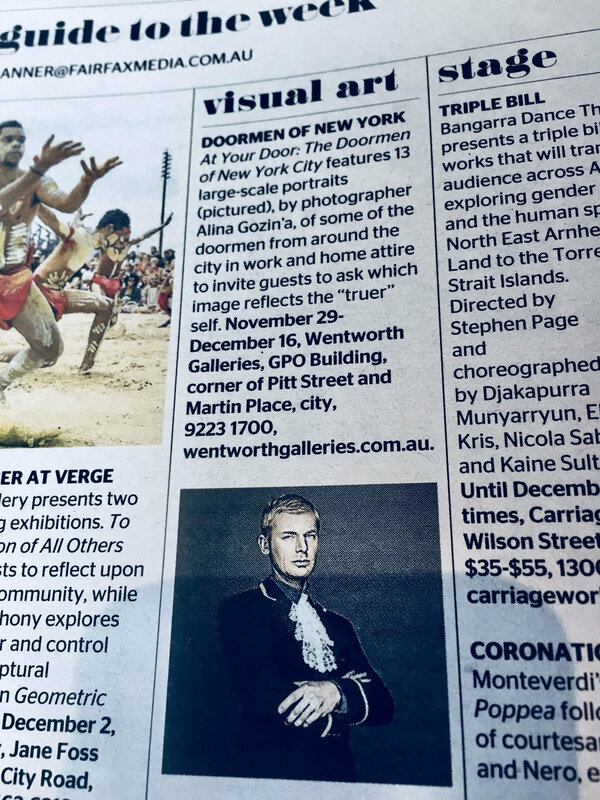 The Doormen of New York exhibition opened in Sydney, Australia in November 2017 and is set to tour to Melbourne, New York, and Moscow in 2018/2019. Alina Gozin’a, an award winning photographer, director and artist, unveils her large-scale photographic exhibition AT YOUR DOOR: THE DOORMEN OF NEW YORK CITY. This body of work captures a quintessential aspect of New York and it's world-famous doorman culture. Three years in the making, AT YOUR DOOR presents El-Greco-inspired portraits of 13 doormen, all immigrants from Eastern Europe. As an artist, Alina explores how important events in history can create a ripple effect across the globe resulting in major, often irreversible changes for humanity. The exhibition opened in November 2017 and was deliberately timed for the 100-year anniversary of the Russian Revolution, which she says was one of the starting points of the diaspora. Doormen typically know the most personal details and are the gatekeepers to Manhattan’s elite. Yet rarely are they seen or their own stories shared. Rather than once again profiling the city’s rich and famous, the artist wanted to shine a light on these fascinating invisible characters who keep Manhattan turning. This body of work reflects Alina’s lifelong interest in telling the stories of people without a voice. 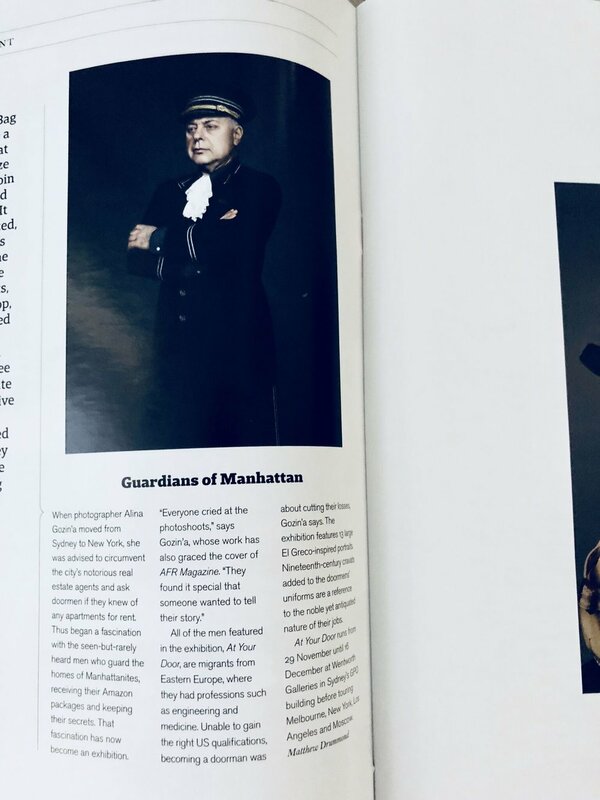 Other than the "fun, fascinating, New York" story of the doorman culture, Gozin'a also wanted to tell the story of the Eastern European immigrants, who were architects, lawyers and engineers in their home country but have taken up jobs as doormen just to get by. She captured these everyday men with the same painterly style and studio lighting she usually reserves for film stars and politicians. In this regard, her work can be compared with iconic photographers of our time such as Richard Avedon whose famed documentary work also captured both extremes of society. Alina Gozin’a is based between Sydney and New York and is represented by Flint and Wentworth Galleries. Behind the scenes snap of the artist being photographed for an article in the AFR newspaper at Wentworth Galleries - set within a 19th century heritage building at No.1 Martin Place. This is Alina’s first exhibition since returning to Australia after living in New York and photographing some of America’s most elite and famous. Three years in the making, her series of portraits of New York doormen presents a rare view into the lives and faces of these notoriously private men, bound by the secrecy of their profession. 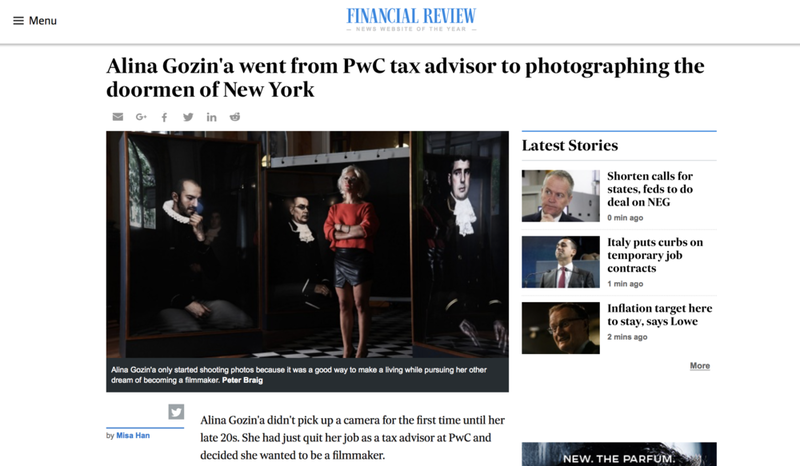 Alina Gozin’a is an award-winning photographer, director and artist based between New York and Sydney. Sydney, Australia: New York-Sydney based photographer Alina Gozin’a has captured many of the world’s most famous faces. Her uncompromising eye and cinematic style often tells a whole story in just one frame. Alina’s fine art photography has garnered a long list of international awards, nominations and exhibitions and earned her a global following. Now she is returning to her native Sydney to unveil her first large-scale photographic exhibition AT YOUR DOOR. 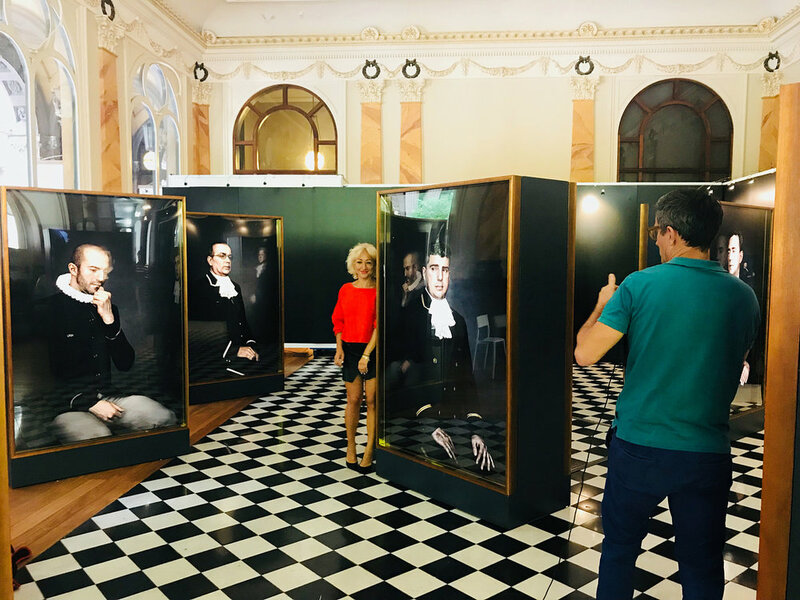 This powerful new photographic series will be presented in a beautifully-restored gallery space set within a 19th century heritage building at No.1 Martin Place. The world-premiere project will open in Sydney before touring to Melbourne, New York, Los Angeles, Moscow and London in 2018/2019. 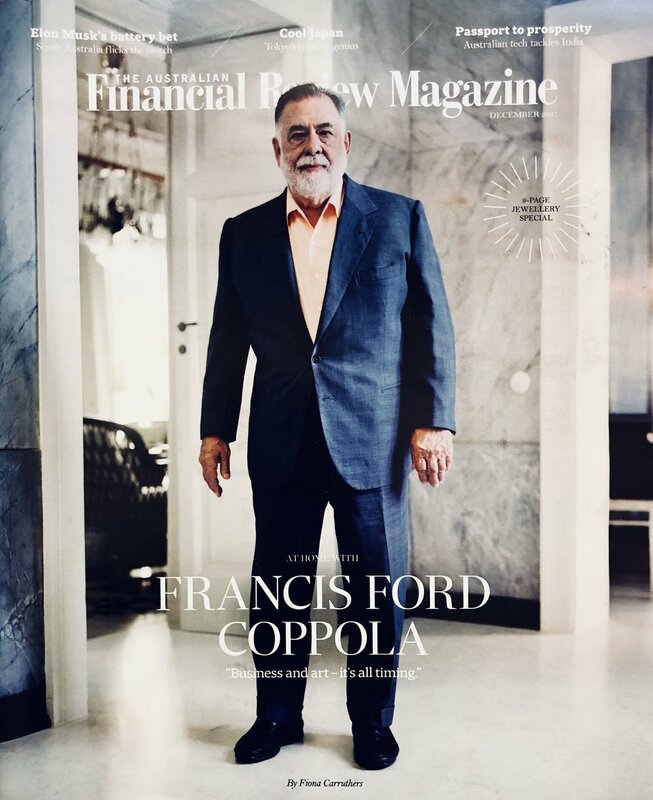 AT YOUR DOOR: The Doormen of New York City captures a quintessential aspect of New York and in particular, the world-famous doorman culture. It also reflects Alina’s lifelong interest in telling the stories of people without a voice. The city’s doormen are the gatekeepers to Manhattan’s elite - this series takes viewers inside the city’s grandest buildings to see behind their firmly closed doors. Doormen typically know the most personal details and well-guarded secrets of their tenants. Yet rarely are they really seen or their own stories shared. Rather than once again profiling the city’s rich and famous, the artist wanted to shine a light on these fascinating invisible characters who keep Manhattan turning. AT YOUR DOOR presents 13 large-scale El-Greco-inspired portraits of 13 doormen, all immigrants from Eastern Europe, looking poised and regal. 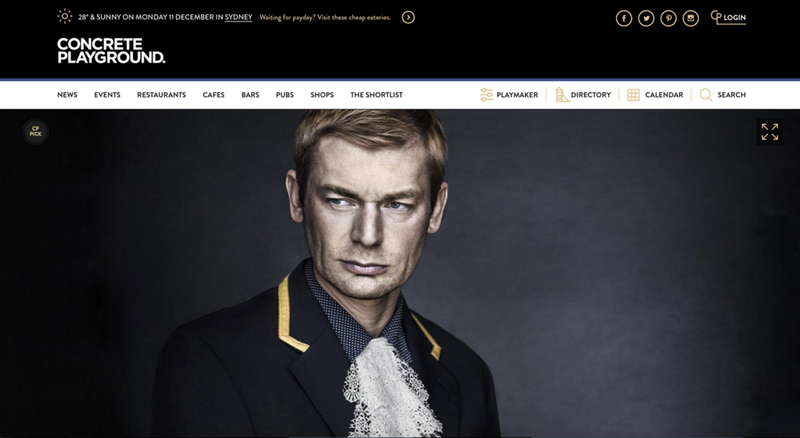 The artist has added a 19th-century cravat to each of the doormen’s uniforms. The cravat is a nod to the men’s European heritage and also portrays them as men of nobility - not just servicemen to New York’s elite. Alina has captured the men first in their doormen uniform, and then wearing their civilian clothes. This juxtaposition creates an intricate reveal to prompt the viewer to ask which one reflects their ‘truer’ self. The intent of the image is to peel off the facade of these anonymous men in uniform, and reveal them as who they really are. Real men with real stories and personalities. The series also raises questions around the necessity of this role. Is it an old-world profession steeped in charm and tradition or the outdated whims of the powerful and privileged? The artist has long been interested in capturing the extremes of society; those either bathing in the sunlight of success or the invisible people in the shadows. This documentary project captures these everyday men with the same painterly style and studio lighting she usually reserves for film stars and politicians. In this regard, her work can be compared with iconic photographers of our time such as Richard Avedon whose famed documentary work also captured both extremes of society. “As if derived from an Old Master’s period, Alina creates not only beautiful portraits, but complex ones, given the intimacy and superb detail of her photographic technique. The effect is of a sublime meditative emotional journey into their lives, souls, and stories,” says New York art curator Angelica Semmelbauer. Alina believes she is drawn to these extremes in her photography because of her own personal journey and fluctuations between two worlds; as a child and as an adult; in her private and her professional life. She grew up in luxury only to see her parents forced to relinquish it all in exchange for a new life in Western society. Likewise, in her adult life she turned her back on the security of a career in tax law at PriceWaterhouseCoopers to pursue her artistic talents and a more creative, albeit tumultuous livelihood. 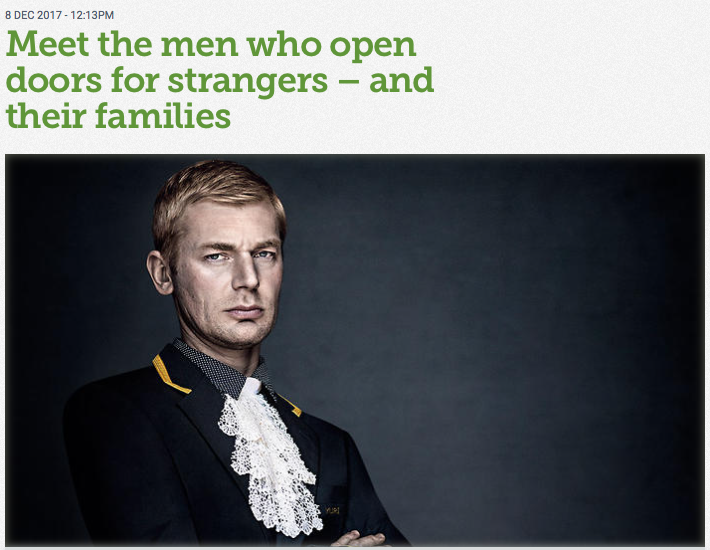 For these portraits, the artist selected doormen who each had profoundly moving stories of immigration from Eastern Europe. At a time of global debate on immigration and in light of the 100th anniversary of the Russian revolution in November 2017, Alina felt their voices should be heard. She also felt compelled to explore themes around the ‘invisible scars of displacement’. It is a subject she understands personally. “I am fascinated by the real cost of immigration. Most of these men had higher education professions in their native countries: they were doctors, engineers, and architects. Their histories did not surprise me, they are all too familiar,” said Alina. “My own family came to Australia when I was 14 years old from the then USSR. When ‘the wall’ came down, we were eager to leave Soviet Russia behind. But we had to give up our Russian citizenship and we were not allowed to take any belongings or savings. It was a price that would have far-reaching effects on my family for many years. I didn’t feel entitled at the time to talk to anyone about it: there are no visible scars, no wounds of war in my experiences, and yet the trauma is very present and long-lasting. I have been fortunate to find a positive way of expressing it through my photography. But not everyone is so lucky and these men have stories of great sacrifice that I wanted to share with the world,” adds the artist. This exhibition is a homecoming of sorts for the artist after almost a decade spent successfully pursuing her photographic career in Europe and America. It is also a homage to her adopted home of New York and the fascinating, irresistible complexity that defines life in that city: a city which was born and built by immigrants all travelling from the far reaches across the globe to America in search of new possibilities.